I’ve been craving comfort food lately! I’ve also found myself unwilling to spend hours in the kitchen when I could be cuddled up with my kids in the family room. My answer? Using the slow cooker! Luckily, lots of delicious comfort food can be made with a long, slow braise that doesn’t need any special attention. 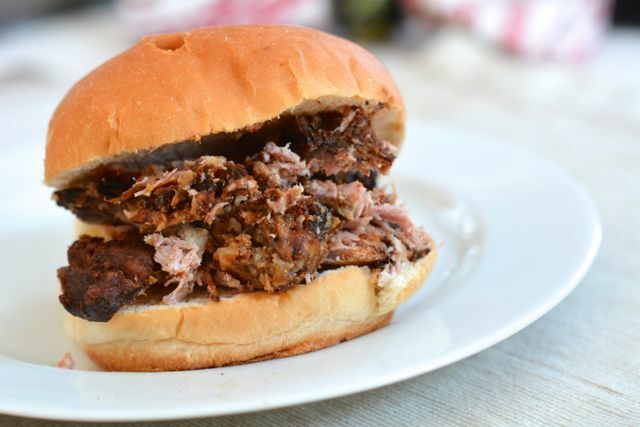 For example, this classic slow cooker pulled pork recipe, which has been a favorite of ours for years. I start it in the morning, let it cook all day, and then shred it up just seconds before my kids burst in the door as hungry as ever. It really is that easy! To make it for your family you don’t need a lot of time—just plan to have the ingredients on hand the night before so you can easily throw it together in the morning. After that, all you have to do is wait, and eat! Step 1: Place the shoulder in a slow-cooker. Step 2: In a large bowl whisk the remaining ingredients. Pour it into the slow-cooker and turn the pork once or twice to coat well. Cook on low heat for 6 to 7 hours, or until it is cooked through and can easily be shredded with a fork. Serve shredded up on hamburger buns and enjoy!